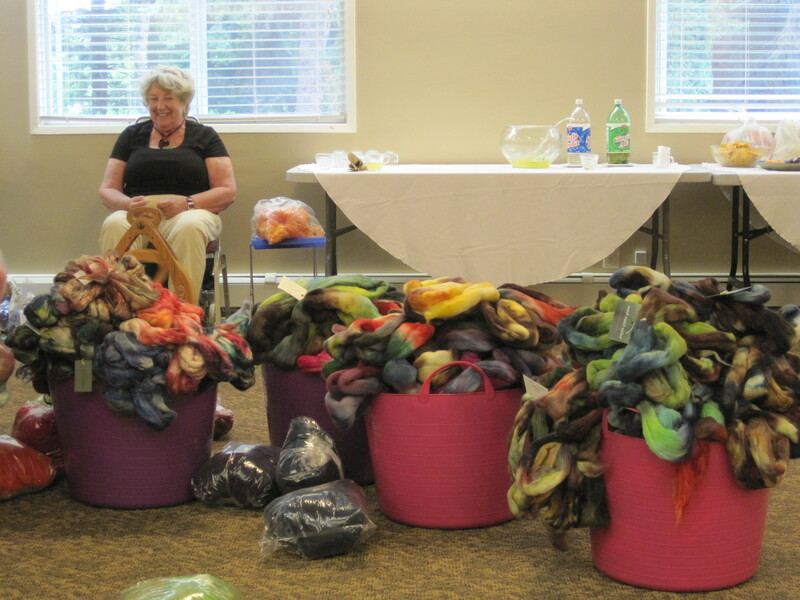 Last week I spent three days in spinning bliss at the annual Peace Arch Weavers and Spinners Guild retreat at the Edenvale Retreat and Conference Centre in Abbotsford. Set in a beautiful country setting I had a great time relaxing with 24 similarly-minded spinners. My room-mate, Linda, and I arrived at 2 pm on Wednesday, set up our wheels in the meeting room and stowed our suitcases in our bedroom. Cheese and crackers were set up in welcome refreshment. Spinners kept arriving, and we created a big circle around the room. Lynne arrived with huge buckets of her beautifully hand-dyed fibres for sale. 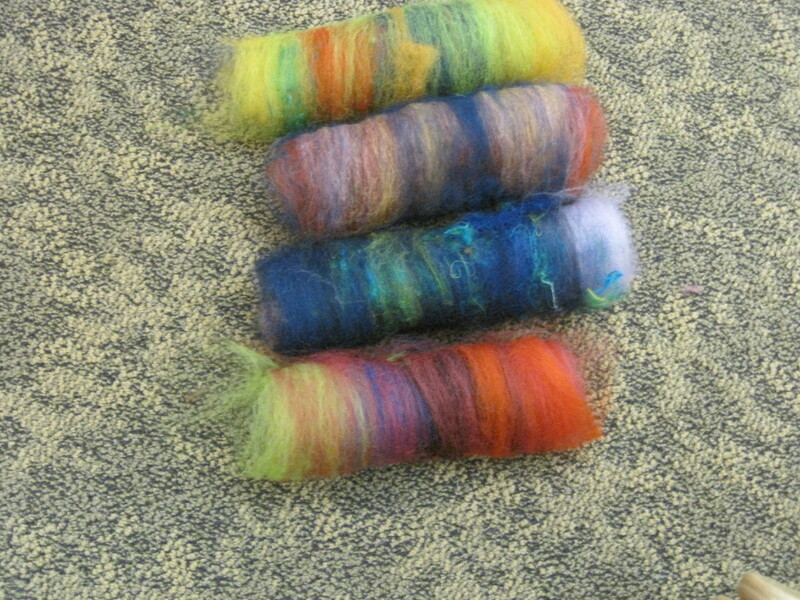 I bought some yak and silk called “Afterglow” to play with. Later in the evening we had a giant show and tell, and Thursday and Friday we carded crazy batts from a selection of 15 different colours. Edenvale is a magical place. It is set in a country house with beautiful gardens and a walking trail through the woods. Once you cross the threshold the pace of life…just…slows…down. For the next two days, my only chores were to sit, spin, chat, laugh, and eat. The slowed pace is an invitation to find a place of renewal, reflection and restoration of life’s order. I think we all were touched by this magic spell. On to the eating, this is the best part. The kitchen staff serve up wonderful nutritious meals, starting with baked salmon and Asian salad for our first dinner. The leftovers were later translated into salmon crunch pie with squash soup for our last lunch. Not to mention the delicious homemade desserts and cookies. Oh, the joy of waiting to be called to dinner with no preparation and no dishes to do! I still like to be the first one up in the morning. That first hour of the day is so precious to me: sitting at my wheel, looking out the window as the day awakens, alone, calm, and reflective. The spinning wheel whispers as the fibre moves through my hands. I hear the first birds chirping their hello to the day. A bunny hops across the lawn, pauses, lifts her head to sniff the air, then moves on. As the wheel keeps turning I take the time to order my day and give thanks for all the good things in my life, and in this moment. The house begins to stir and other spinners step into the room to greet me with smiles and hugs. We move on to breakfast and the joy of conversations and connections with friends old and new. This entry was posted in Spinning, Travel and tagged carded batts, carding, colour, Edenvale, fibre, Guild, handspun, Silk, Spinning, Spinning wheel, Wool, yak, yarn. Bookmark the permalink.